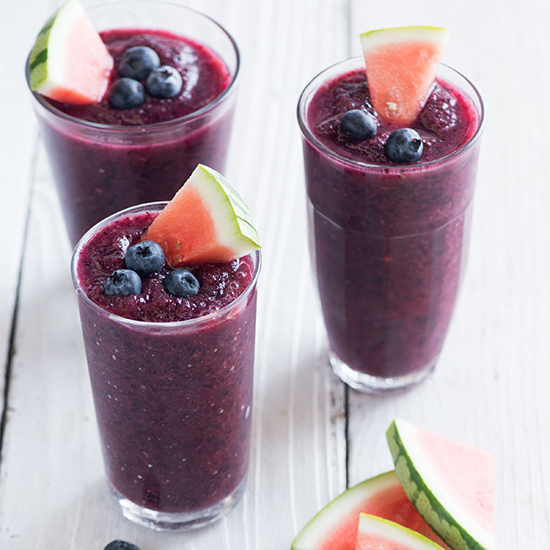 Celebrate summer parties with this delicious blueberry and watermelon slushie. It’s the perfect cooling drink on hot days. Since this recipe doesn't call for any alcohol, it's the perfect frozen drink for the whole family. However, you should feel totally free to spike it. We especially like it with rum. Blenders are excellent kitchen tools for making delicious frosty beverages. (With or without alcohol!) Here are seven crazy-refreshing and super-easy recipes to try this summer. A quick puree of fresh strawberries and lemon zest creates a delicious fruit floater for this ultra-creamy milk shake. Celebrate summer parties with this delicious blueberry and watermelon slushie. It’s the perfect cooling drink on hot days. These slushy, potent cocktails are easy to make in batches. They're also ideal for parties because most of the preparation can be done in advance. Typically, Bourbon Milk Punch is made with half-and-half or milk. This frozen version, based on the one served at the New Orleans restaurant Bourbon House, is blended with ice cream—and tastes like a boozy milk shake. This spike slushie includes limoncello, a sweet lemon-flavored liqueur from Italy. Michael Solomonov was born in Ganei Yehuda, Israel, where this frothy lemon nana, flavored with mint and lemon verbena, is a popular cooler.